Monarch Butterflies have been known to travel as much as 5,000 miles in a year! They're also one of the few insects that is capable of making a trans-Atlantic crossing. ■ Milkweed contains a chemical that tastes disgusting to birds. 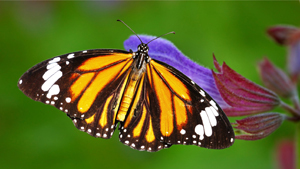 If birds didn’t associate that taste with the Monarchs, the butterflies would be nearly defenseless against them. ■ During the larval stage of their lifetime, the Monarch Butterfly is completely dependent on milkweed. ■ It's believed that the Monarch Butterfly uses the Earth's magnetic field to find the town of Angangueo, Mexico where it spends the winter avoiding the cold.